If you've ever stood in the camping section of a big box store and wondered how you could snag one of those miniature display tents for your pet, wonder no longer. Enter Cat Camp, an Australian company that has created teeny tiny tents for indoor cats. 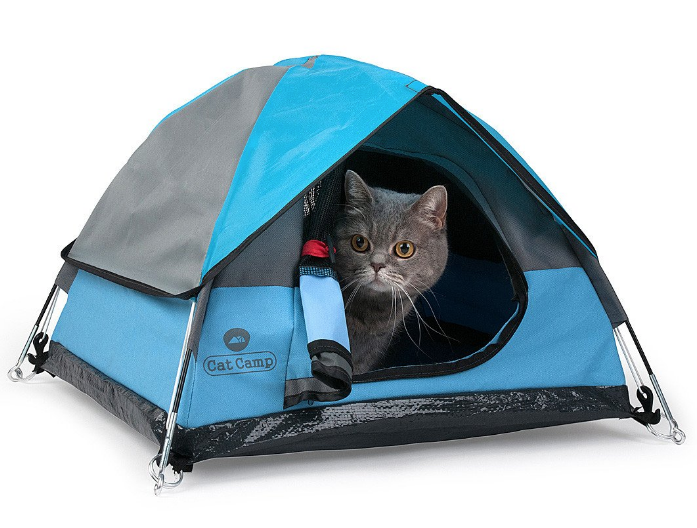 Their Cat Tents ($59.95) pitch like a human-sized tent but, to be clear, these are for inside the house, not the great outdoors. We set out to create the most unique, high-quality cat bed. This product is modeled on full-size tent and made to look just like the real thing. Cat Camp is a great addition to any house and a cozy hideaway for all cats. Cats love small, dark and comfy places - this behavior is instinctive so they can hide from predators and they naturally feel safe when the walls of a box or tent come into contact with their little furry bodies.